Instead, all he managed to do was solidify his image as a Marxist/socialist whose only goal is wealth redistribution. It’s as if Obama sees himself as the school principal, angry with the kids who are excelling and making good grades. He feels it’s his calling to punish those earning A grades, regardless of the long hours of studying, discipline, and hard work they’ve invested. Principal Obama wants to be popular with kids making D and F grades. Instead of promoting a new school policy of tutoring and mentoring, he just wants to redistribute the grades. In the end, he believes he’ll be able to create an entire school of average students all earning a C.
You may remember President Bill Clinton’s famous retort during the Monica Lewinsky episode regarding the definition of “is.” Now it seems President Obama faces the same issue of definition. First Americans were told “if you like your healthcare plan you can keep it, period. If you like your doctor you can keep him, period.” We now know that “is” not the case. President Obama and his minions assessed your plans as substandard according to he who knows what is, is, and we know he knows what is best. And of course we all did not understand what Obama meant what is, is, so he just misspoke and then told the insurance industry what is, is, and that they should just put everyone back on their plans — since Mr. Obama’s definition of is, is that he can simply command something to occur. Apparently Secretary Sebelius has redefined functional to mean you do not get an error message but you are in the queue to be serviced — your information “is” being processed, albeit in a totally unsecure mode. During Hanukkah, the American Jewish community remembers the victory of the Maccabean army led by Judah Maccabee against the invading Hellenic army, the restoration of the Holy Temple and the miracle of the oil in the 2nd century BC. I don’t think President Obama cares much for Jewish history but he probably should, especially before calling PM Benjamin Netanyahu. During a phone call between Obama and Netanyahu last week, the president reportedly asked Netanyahu “to take a breather from his clamorous criticism” of the interim agreement reached with Iran, David Ignatius reported for the Washington Post Wednesday. Obama called Netanyahu last Sunday to discuss the interim deal reached with Iran – a deal the prime minister called a “historic mistake.” After Netanyahu reportedly “rebuked” Obama over the interim deal, he told Obama that the permanent accord “must bring about one outcome: the dismantling of Iran’s military nuclear capability,” the article said. First of all I would recommend our man-child president not take on someone with a warrior’s heart in the vein of the Maccabees, who is a former Airborne Commando in the Israeli Defense Force. I pray everyone enjoyed a very blessed and Happy Thanksgiving with family and friends. We enjoyed a special Thanksgivukkah at the home of our friends and at sundown, lit the Menorah candles, and gave blessings in Hebrew and English before we found delight in a delicious meal. Yes, we discussed the state of our nation over dinner and came to realize that slowly America is being redefined and fundamentally altered. Every operating system, our economy, our work ethic, our core values, our national security and our foreign policy is being remade into something that is hardly recognizable. Tempus fugit is Latin for “time flies” and before you know it, Thanksgiving 2014 will be here. We shall gather again to give thanks, but will we still be sinking under the fundamental transformation of America or shall we have begun to right this ship? When a policy is failing how do President Obama and his acolytes solve the issue? Fabricate positive press, of course. The Obama campaign machine is desperately kicking in overtime to combat the truth, or as they classify it, “bad press” on Obamacare. Apparently event the AARP has been sending out “Evites” to have parents and grandparents guilt-trip the younger generations to sign up for Obamacare, as families gather for turkey day dinner. WAIT THERE IS MORE TO THIS STORY – CLICK HERE TO READ IT! America elevated Barack Obama to the highest position in the country to eradicate any sense that this nation judged anyone based upon the color of their skin. However, this great nation was so dedicated to pressing forward and forgetting past injustices, we allowed affirmative action to take hold at the highest level. The fundamental thesis of Shelby Steele’s book White Guilt aptly applies to the case of Mr. Obama. The guilt that white America – primarily white liberals—wanted overcome and wash away created the first affirmative action presidency. It is not that standards were simply lowered; they were, and remain, non-existent for the first African-American president. And any questioning of President Obama is deemed as racist. WEST: Affirmative Action, not ability or experience, elects President Obama | Washington Times Communities. Nothing good happens late at night, and America just had a modern-day Neville Chamberlain moment. At 3 am in Geneva, Iran and 6 major powers agreed to “temporary relief” of sanctions in return for Iran stopping or scaling back parts of its nuclear program. President Obama has just empowered the number one state sponsor of terrorism, Iran, to pursue its nuclear goals and objectives. This is not diplomacy, this is abject surrender and appeasement. Iran loses nothing, not a single facility, not any capability to enrich uranium, but we have conceded the one best non-military option: economic sanctions. President Bill Clinton promised the same in regards to North Korea, and did that have any effect? Not to mention that North Korea has taken an 85-year-old Korean War veteran into detention, and of course we have done nothing. Iran has held American Christian minister, Saeed Abedini, in prison for nearly a year, and President Obama said nothing about his fate, nor demanded his release. Israel and Saudi Arabia have lost all trust and confidence in America as a credible ally. 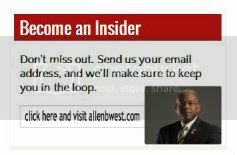 Allen West “Are we going to promote an opportunity society or a dependency society? West and fellow panelist Professor Jan Ting of Temple University were discussing what they called the “new normal” in America—how Americans are not succeeding independent of the government in record numbers.